Our gluten free chicken recipes provide gluten free meals for all occasions. Whether you are looking for a dish for a regular family meal or to entertain friends at a dinner party our gluten free chicken recipes are here to help. Our aim is to provide a range of easy gluten free recipes which anyone can make, whether you are an experienced gluten free cook or a first timer. When making gluten-free recipes following a few simple rules will ensure your gluten free meals stays gluten free, we have some easy to follow tips on our Avoiding Gluten page. This is a delicious and easy gluten free chicken recipe. 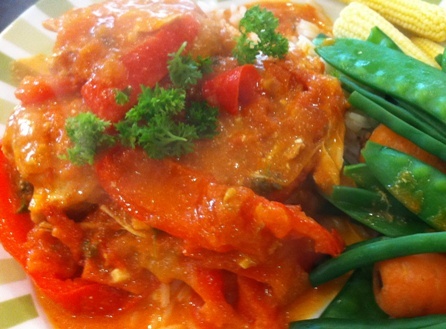 A tasty moist dish with marinated peppers and cherry tomatoes, topped with an orange and paprika dressing. Add it to your list of gluten free meals for eating in your garden on a warm summer evening. This is one of our favourite chicken recipes. 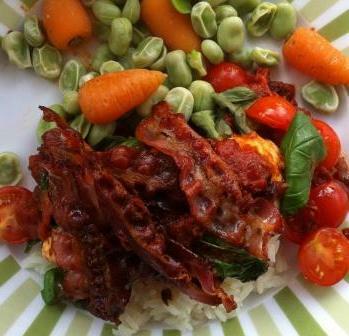 Our Gluten Free Chicken Pancetta Recipe is really versatile. You can make it for a regular family meal or for a relaxed meal to share with friends. Dress it up in summer with fresh salad or have it as a winter warmer with roasted vegetables. This gluten free chicken recipe makes a wonderfully sophisticated meal. Put this Gluten free Roasted Chicken with Artichokes Lemon and Thyme Recipe on your list of great gluten-free recipes for a dinner party. 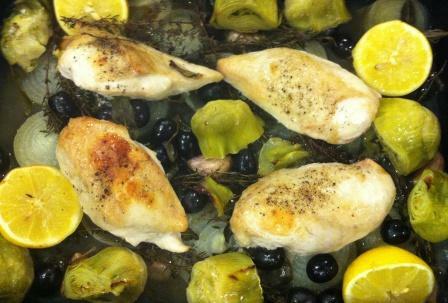 You roast the chicken with lemons, onions, garlic and olives, mixed with thyme and sage. The mix of flavours and textures makes this chicken dish a real treat. A gluten free chicken dish which is ideal for summer. 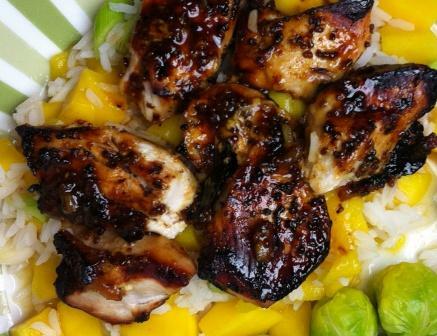 This Gluten Free Chicken with Mango Rice Recipe delivers delicious sticky chicken served on a refreshing bed of mango rice with a wonderful mix of zesty flavours. One of our gluten free recipes which is ideal for the summer. A tasty blend of marmalade and mustard makes a sticky glaze for the chicken. Mango, spring onions, cumin and white wine vinegar make a great combination with the rice. Moist and succulent gluten free chicken served with mashed sweet potato and tasty green vegetables, what could be more delicious. Easy gluten free recipes that have fantastic flavour are a winner, and this Gluten Free Almond Chicken Recipe is a great example. The flavours from the ground almonds, chicken and tarragon blend beautifully together. Gluten free meals don’t come much better than this tasty, creamy dish. This Gluten Free Chicken Paprika Recipe is a very satisfying blend of flavours from the chicken, peppers, tomatoes, paprika and sour cream making this a great winter warmer. I'm Janne. I create recipes and provide tips for enjoying fantastic food that just happens to be gluten free. Whether you are living gluten free full-time, trying it out or cooking occasionally for family and friends. This is gluten free for foodies. I promise to use it only to send you How2bglutenfree Newsletter. We update our tasty gluten free recipes and information on living gluten free regularly. Let us send you a free email periodically to let you know what's new.